Oh my gosh! Once again, I’m in a mad dash to get as many Bath & Body Works and White Barn candles reviewed for Candlefind before they’re gone and you can‘t buy them anymore. They change what candles you can buy so fast, it’s hard to keep up. My latest candle affair… Harvest Gathering from White Barn Candles. I bought this one on a whim… I loved the name and thought it would make a perfect fall review and here we are full swing into winter now – oh well right? Better late than never. I love White Barn and tend to purchase all the candles at Bath & Body Works that have the White Barn label. Every candle I’ve tried has been authentic, long lasting and consistently strong. What more can a candle lover as for? What did my Harvest Gathering look like? This candle was their standard 14.5oz large 3-wick jar. Love these jars!! They’re wide with nice big melt pools. The wax was a caramel/orange color… the label on the candle showed the White Barn Logo with what looked like a fall cornucopia kind of centerpiece… it had apples, fall leaves, grapes, a glass of wine. What did my Harvest Gathering candle smell like? Ah! Cranberry… that’s the fruity note I was detecting! One aspect of White Barn Candles I’ve come to rely on and love… scent authenticity and strength. Their candles have always been room fillers for me and this candle lived up to that and more. I lit my Harvest Gathering candle early morning and not even 15 minutes later… the fragrance filled my entire bedroom and beyond so this candle is definitely a room filler. Once burning, I wasn’t really detecting any cinnamon notes… to me, this scent smelled like fall leaves and cranberries with hints of apple. It was quite unique! Have to add… my hubby wasn’t sure if he liked this candle or not. He called it “potent” and said he could smell pine or something mint’y in the air. I didn’t get that at all but it’s still an observation I like to add whenever he comments on a candle I’m reviewing. He only comments when he loves or hates something. Scent strength – on a scale of 1 to 10, this candle was between an 8 and 9. It was pretty strong! I thought it was perfect. I totally recommend this candle if you’re after a nice fruity fall/winter fragrance. How did my Harvest Gathering candle burn? My candle burned perfect! I love these 3 wick jars. Super even burns, nice big melt pools and totally clean burning. LOVE!! This was a great candle and gets the highest rating – 5 stars. 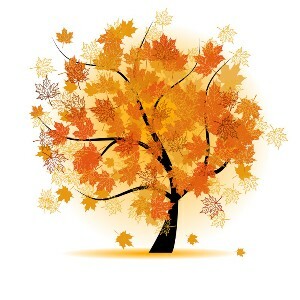 It had all the elements of fall and gave a nice fruity aroma which I really liked. It was a nice change from all the heavy and spicy scents I’ve been burning lately. If you love fruity scents, this is a great choice if you’re after something that’s a bit more sophisticated. I love White Barn Candles and don’t think you can go wrong with any scent you try from this brand. They have always exceeded my expectations. 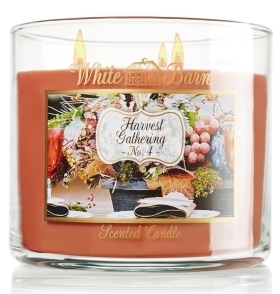 Have you tried Harvest Gathering from White Barn Candles? Review it with us. In the comment section below, review and star rate your experience… it’s easy! Harvest Gathering - White Barn Candle scent description: Gather with the ones you love and enjoy the richness of autumn in this blend of red apple, cinnamon leaf and tart cranberry.